Goldstar Jets, Inc. Goldstar Jets offers the highest quality platforms in the industry. Each aircraft is impeccably maintained and state of the art. Having not only domestic but global reach, and can be available to service their clients at a moments notice anywhere in the world. Goldstar Jets international presence is magnified exponentially by their extensive network of affiliates with whom they have partnered to provide their clients with the broadest range of travel options possible. 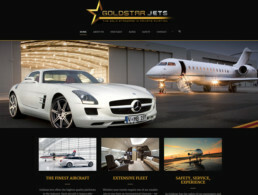 ClientGoldstar JetsServicesWeb Design, Web Development, Web & Infrastructure Hosting, E-Commerce, Promotional Design, Marketing Strategy, Branding, Search Engine Optimization, Social Media Marketing, and more.